The loss of deciduous oak woodlands to native conifer encroachment is a major conservation concern in northwestern California and across much of the Pacific Northwest, resulting in associated losses of wildlife habitat, cultural uses, biodiversity, and other ecosystem services. These losses have drawn increasing attention in recent years, and oak woodland conservation and restoration efforts have gained momentum throughout the ranges of Oregon white oak (Quercus garryana) and California black oak (Quercus kelloggii), the two species most afflicted by encroachment. Deciduous oak woodlands have long been central to the ecology and culture of northern California. Oak woodlands support high levels of biodiversity and provide essential habitat for wildlife, and they are also deeply rooted in the human history of the region, as they have both sustained and been sustained by Native Americans, ranchers, and other local groups throughout recent history. However, management changes over the last century have altered these ecosystems, and both Q. garryana and Q. kelloggii woodlands are in decline throughout their ranges. CA black oak stretching for light among young, encroaching Douglas-fir. One of the primary concerns in Q. garryana and Q. kelloggii woodlands is the change in disturbance regimes that historically shaped and maintained these ecosystems. Oak woodlands are fire-adapted, depending on frequent, low- to moderate-intensity fires to prevent establishment of invading fire-sensitive vegetation and supply conditions suitable for regeneration. Fire exclusion over the last century has resulted in direct and indirect impacts to oak woodlands, affecting recruitment and persistence, stand structure and fire regimes, and overall capacity to persist on the landscape. Though minimally studied, native conifer encroachment is widely recognized as one of the most widespread, direct outcomes of fire exclusion in North Coast oak woodlands. Conifer encroachment has been documented in a range of oak woodland types in northwestern California, and is commonly implicated in widespread decreases of woodland extent throughout the region. In their 1987 analysis of the Bald Hills of Redwood National Park, Sugihara and Reed documented a loss of almost 30% of white oak woodland area to encroachment by Douglas-fir (Pseudotsuga menziesii) since 1850, and further losses have occurred since. Throughout the region, encroachment is visible from all major highways that pass through areas where oaks and Douglas-fir overlap; the magnitude of these landscape-level changes is staggering. Related research shows a number of ecosystem-level effects of conifer encroachment, including changes in stand structure, species composition, and fire regime. Prior to the 1850s, when European settlers became established throughout much of the Pacific Northwest, oak savannas and woodlands were maintained by frequent, low-intensity fire, which favored a flammable, herbaceous understory and limited both stand density and conifer establishment. 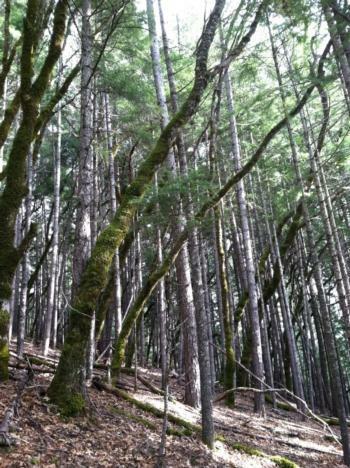 Douglas-fir invasion limits understory plant diversity, dampens fuelbed flammability, and results in stand densification, altering the nature and potential of fire on the landscape and complicating management efforts. Furthermore, encroachment may reduce oak vigor and elevate tree stress, rendering remnant oaks more vulnerable to fire while Douglas-fir increases in size and resilience. Changes in fuelbed flammability and oak vigor are positive feedback cycles, facilitating further conifer invasion and increasingly challenging woodland persistence and restoration. Without frequent natural and human disturbance, like that which shaped and sustained these systems for millennia, deciduous oak woodlands will suffer increasingly severe losses in our region.